We offer a cutting-edge package of services for the solar and renewable energy industries. 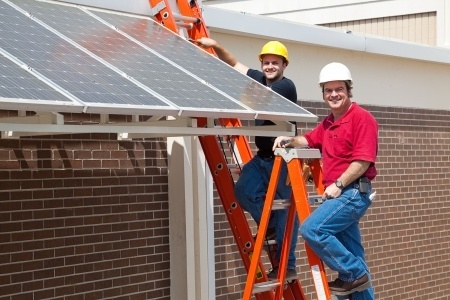 We specialize in solar workers’ compensation, however, we can meet the insurance needs of any scenario your solar company requires. In particular, the American solar industry has grown exponentially and solar installations are booming. The solar industry has blossomed with billions of dollars in new venture capital. The U.S. is the fourth largest solar electric market in the world with key domestic markets in California, New Jersey, Florida, Nevada, Arizona, Michigan and New York. We are excited to see photovoltaics (PV) booming and have geared an insurance program that is plug-and-go. The U.S. PV market has grown at an average annual rate of 69% over the past ten years. Currently, “thin film” technology is a key interest in this industry. Thin film has a lower production cost by using less silicon than other types of solar cells. Hybrid Financial Group offers workers’ compensation insurance that complies with the requirements of each state. Our solar worker’s comp and insurance solutions are designed for the solar industry and companies of any size. We especially have a niche program for those that work with photovoltaics (PV), concentrating solar power (CSP), and solar heating and cooling (SHC) technologies. The solar industry has serious risks involved and we can help minimize them for your solar company and for your insurance program. We help to minimize risks associated with managing hazardous chemical exposures, disaster recovery as production may run 24/7 and developing ergonomic processes that protect workers. Our solar worker’s comp program provides solar industry clients with specialized, comprehensive coverages designed specifically to simplify and streamline your insurance needs. We handle the headaches so you can focus on managing and growing your energy business. We can work with businesses engaged in the Commercial on-shore wind and/or solar industry for the full life span of development We can partner through the R&D phase and manufacturing, through installation and permanent operations. And we work with a multitude of clients ranging all sizes and phases of development. We love start-up companies as well as Fortune 500. We include software developers, metal goods manufactures, integrators, contractors, operations and maintenance service and power providers, in our area of expertise. Your solar or wind company will have immediate access to a full range of products that meet your insurance needs. Get connected to a member of our team now and let’s get your insurance program operating on turbo.